Prime Minister Binyamin Netanyahu and Knesset Speaker Yuli Edelstein highlight similarities between Israel, Ukraine in state visit. ”Your visit here today is a testament to our countries` warm and dynamic relationship in the international arena," he said. "Ukraine and Israel cooperate in numerous fields, including trade, science and culture." ”Our nations share a history of more than 1,000 years," he continued. "The Hassidic movement grew in Ukraine, many Zionist leaders operated there, and Jewish art and culture flourished." Turning his attention to the global terror threat, Edelstein called on the world`s nations to unite in the fight against radical Islam. ”Unfortunately, our nations' right to live in peace and security cannot be taken for granted. I hope that the prolonged internal disputes in your country, and the struggles which have resulted in so many victims – will be resolved soon,” he told President Poroshenko. ”Israel, for its part, is dealing with its own challenges. We are doing [all we can] to promote peace and cooperation initiatives with our neighbors and allies overseas in order to create a better world and a civil human society." ”Like you, we are an ancient nation, but our country is young, and we want to experience the future together while cooperating in [the fields of] culture, technology and medicine," he said. 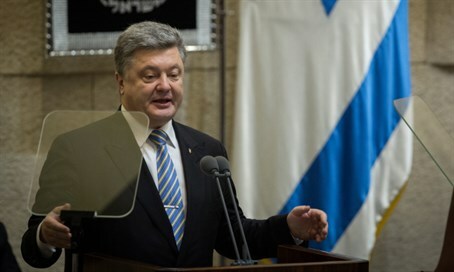 ”We appreciate your efforts to protect the rights of Jews in Ukraine in the face of anti-Semitism," he stated. "We are facing bitter enemies who refuse to recognize us, but there is a global struggle against a force that wants to take the world backwards, including the countries surrounding the Black Sea." ”In the face of this barbarism, we must stand together as a united front," he continued. "We have a peace agreement with Egypt and Jordan, and we would gladly expand the circle of peace, with the Palestinians, but first they have to recognize us."